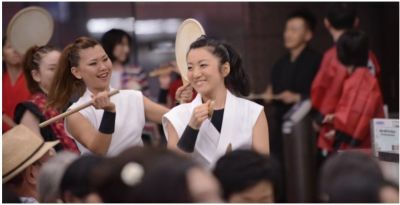 TOKYO, Aug 10, 2015 - (JCN Newswire) - Extending invitations to local citizens of Bunkyo Ward, Toyota converted its lobby from a showroom into a relaxed, comfortable performance space for a concert featuring traditional instruments and dance. Elderly and disabled citizens were given special consideration in ticketing and seating, and Toyota staff volunteered to help organize and run the event. Booths and displays enhanced the festival theme while also promoting local goods from the Tohoku region, which is still feeling the impact of the 2011 Great East Japan Earthquake and resulting tsunami. While concert tickets were free to all applicants, sales of Tohoku crafts at the booths gave concertgoers a chance to contribute to the recovery of the stricken region. As the sun set upon the greenery outside the windows, drum troupe Bonten provided the crowd with some quality rhythmical performance with all the flavor and cheer of a summer festival, complete with dancing and audience participation. The crowd was swayed by Bonten's emotional rhythms and passionate performance, singing along and drumming in the air. Building on the bright grins and overflowing energy of these young women and their chaperone, Masaki Nakamura followed on with the ethereal whistling of the Japanese-style flute, the shakuhachi. The emotive performance included such well-known tunes as "Amazing Grace." The final performance came from percussionist Sayaka Nojiri, providing a western influence featuring the pert tones of the xylophone-esque marimba. After a break from the music during which the crowd were given time to mingle and peruse the stores, it was time for something exceedingly rare. While a collaborative performance of traditional Japanese drums and shakuhachi may not be unusual, throw the exotic marimba into the mix and you have a unique experience. Rounding off the concert, a final jam session brought all the evening's performers together in a fusion of musical talents. The all-natural wooden frames and animal skins used in the Japanese instruments blended effortlessly into the natural wooden blocks of the marimba--an instrument that includes both African and Mexican origins. It was a magical experience for all present and completed the evening with a symbolic spirit of cooperation.